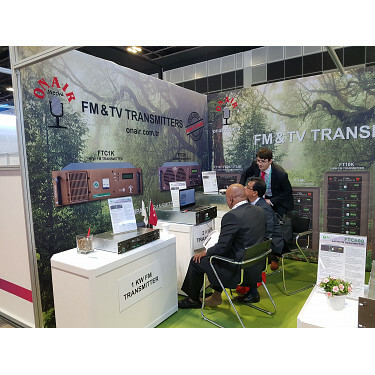 We also presented our key products 25W to 20KW FM LDMOS transmitters designed using the extremely rugged LDMOS power transistors. They are very rugged against reflection, very efficient and with extra ordinary performance. All our transmitters have built-in RDS programmable from the front keys of the exciter or via RS232 connecting to a computer. Since it gives massive importance to low energy consumption, it has GPIO switch that runs air-conditioner when the room temperature or humidity reaches the limit value. ONAIR FM transmitters main features are less heating, less energy consumption, less complicated, and have a very reliable design. ONAIR MEDYA stands to be the best manufacturer of professional broadcast equipments using the innovative technologies and delivering high quality broadcasting equipments at affordable prices. . We provide broadcasting equipments and services globally with a full range of broadcasting solutions which are tailored to meet the evolving needs of our clients and partners. Our aim is to deliver products that are both of a higher quality and more cost effective than any comparable product in the market.